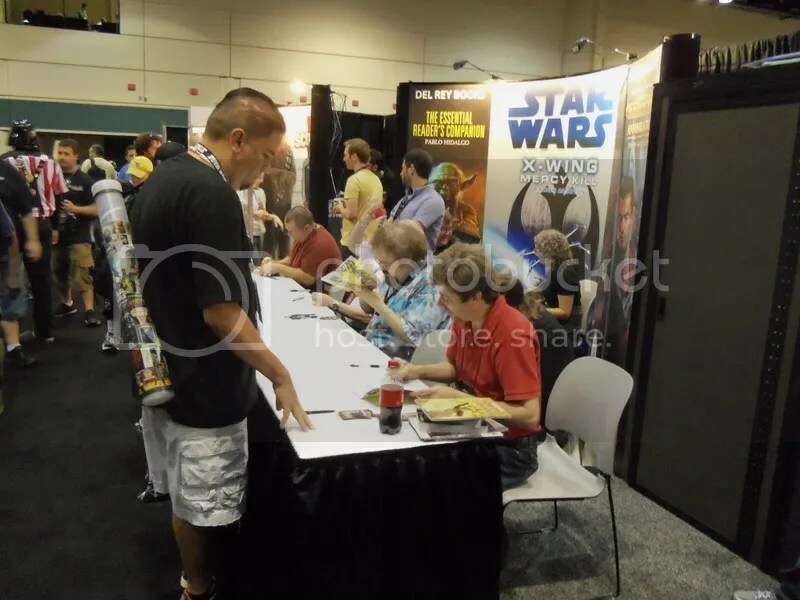 Our last day at Star Wars Celebration VI, the day 4 recap. My last day at Star Wars Celebration VI was an eventful one. Starting in the morning with a visit by Anthony Daniels as we all waited in the giant queue line to get in, to my interview with author and comic writer John Jackson Miller. But let’s start with the first panel I attended, Writing Comics for the Star Wars Galaxy. 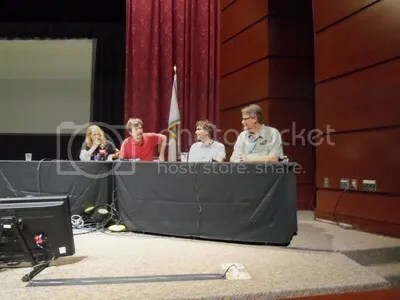 This panel was hosted by Dark Horse Comics Editors Randy Stradley and Dave Marshall, comic artist Jan Duursema, and comic writer John Jackson Miller. One of the things I really liked about this panel was that it shined some light on how the Star Wars comics are made and how the process has changed over the years. Jan revealed that her and John Ostrander typically due a full script with both of them working on the plot together. Then John does the script, sends it to Jan. From there they go back forth with phone conversations to work out any changes. Jan mentioned that John has an acting background and likes to do voices for all the characters, which I thought was really funny. John Jackson Miller talked a little about the differences between the old Marvel method of doing plot and script versus what they do now with full scripts. He and Randy Stradley also commented on how one of their goals in doing comics is keeping the pacing brisk. You don’t want too many words and too many panels. Sound effects was another issue they went over. In particular, John Ostrander didn’t want to do any sound effects in the Legacy series. Randy, on the other hand, was of the opinion that sound effects need to be handled carefully. You don’t want to do without them because sometimes they can be useful, especially in pacing. Sometimes you get a panel that doesn’t have any words, so a reader will just skip over it without noticing what’s going on. But if you throw in a sound effect, they’re forced to pay closer attention to see what’s going on. Too many sound effects just become distracting. I like how Randy put it, “Sounds are like punctuations,” in that they are used to add emphasis to a scene and have to be used correctly. One last thing they brought up that I’d like to touch on was the discussion of freelance artists. Many of the artists the writers work with are overseas and most of them don’t speak English. When working with these freelance artists, the writers sometimes run into issues with translations errors. For example, John Jackson Miller was working on an Iron Man comic and put into the script that Iron Man should raise his arm in defense. Somewhere in translation arm in defense equated to the artist giving Iron Man an actual gun in the panel. Another example was a famous one that Randy Stradley recounted where the writer asked the artist to leave room for the balloons and the artist ended up drawing a bunch of balloons instead of leaving room for the word balloons. Brian Wood ran into a translation issue with his comic The Massive when he asked the artist to put some Chinese on the side of a ship. Instead of putting Chinese writing on the side, the artist actually drew Chinese people on the side of the boat. So as you can see, translation can be a vital issue when writing scripts and it’s important to be concise and clear. After the Dark Horse panel, I had some time to kill, so I circled around the exhibit floor and took a bunch of pictures. 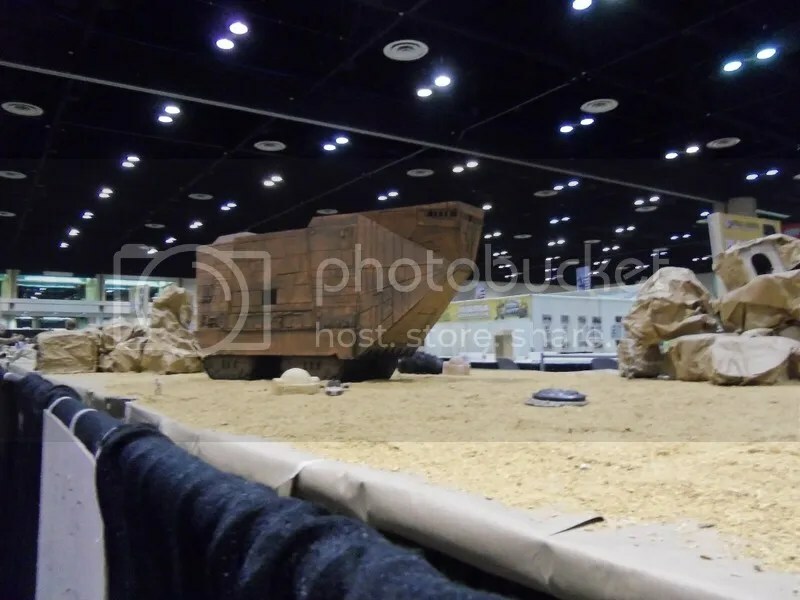 By this time, the do it yourself dioramas were coming along with lots of cool displays including a big Jawa sandcrawler. I’ll share more pictures later, but other scenes include a Tusken Raider village, Mos Eisley, and the rancor pit. Del Rey also had a sampler signing going on with all the authors (well most of them) sitting down to sign copies for the fans. The sampler contained a bunch of excerpts from recent and upcoming Star Wars novels as well as short stories that were published in Star Wars Insider magazine. The next essential guide will be The Essential Guide to Characters, written by Dan Wallace and fully illustrated by Doug Wheatley. This is the secret project Dark Horse mentioned at their panel. Doug will be doing 150 character illustrations for the book and they looked gorgeous (I haven’t got those pictures uploaded yet, so I’ll make sure to post them later). They have been working on the book since April and are expecting a July 2013 release. Pablo Hidalgo went over The Essential Reader’s Companion and share some details one what we can expect when it comes out. The book is going to be a whopping 496 pages with 150 to 160 illustrations including individual portraits done by Brian Rood, and scenes done by Chris Trevas. The guide will cover 410 works altogether including all of the adult novels, all of the young reader material rated for over age 8 (all of Jude Watson’s books will be included), and most of the short stories including all of those printed in the Adventure Journals. The works will be in chronological order though there’s of course some judgement calls on where some books would be placed. For instance Darth Plagueis is placed by the time of the end of the book rather that the starting point. The Jedi Prince series made the cut and will have a special side bar all unto itself. None of the choose your own adventure material will be included, and the game guide material was also left out. While in chronological order, there will also be suggestions for readers telling them where they can head next and what other works they may want to check out (even a few comic mentions). Some of the character illustrations they showed off included: Wynn Dorvan and Pocket, Allana and Anji, Cal Omas (whose visual appearance was base off of a printer sales rep who happened to walk into the Del Rey office one day), Bollux and Bluemax, Mirta Gev, a group show of the young Jedi knights, and Anakin and Tahiri’s first kiss. For the characters that didn’t make it, Suvudu will be showcases some of those on their site as fan bonuses. Well Star Wars Celebration VI is officially over now and a lot happened. While I couldn’t fit everything into the daily recaps, I’d tried to give a nice overview and I hope you enjoyed them. Expect to see more pictures to follow, as well as some interviews, and additional write ups. And maybe, just maybe, a giveaway or two.